Ephrem is also variously known as Ephraim (Hebrew and Greek), Ephraem (Latin), Aphrem and Afrem (both Syriac). However, "Ephrem" is the generally preferred spelling. Syriac — ܡܪܝ ܐܦܪܝܡ ܣܘܪܝܝܐ — Mâr Aphrêm Sûryâyâ. Greek — Ὅσιος Ἐφραίμ ὁ Σῦρος; — Hosios Ephraim ho Syros. Ephrem was born around the year 306, in the city of Nisibis (the modern Turkish town of Nusaybin, on the border with Syria). Internal evidence from Ephrem's hymnody suggests that both his parents were part of the growing Christian community in the city, although later hagiographers wrote that his father was a pagan priest. Numerous languages were spoken in the Nisibis of Ephrem's day, mostly dialects of Aramaic. The Christian community used the Syriac dialect. Various pagan religions, Judaism and early Christian sects vied with one another for the hearts and minds of the populace. It was a time of great religious and political tension. The Roman Emperor Diocletian had signed a treaty with his Persian counterpart, Nerses in 298 that transferred Nisibis into Roman hands. The savage persecution and martyrdom of Christians under Diocletian were an important part of Nisibene church heritage as Ephrem grew up. St. James (Mar Jacob), the first bishop of Nisibis, was appointed in 308, and Ephrem grew up under his leadership of the community. St. James is recorded as a signatory at the First Ecumenical Council in 325. 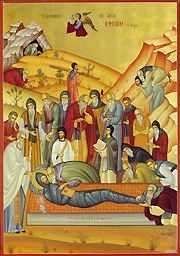 Ephrem was baptized as a youth, and James appointed him as a teacher (Syriac malpânâ, a title that still carries great respect for Syriac Christians). He was ordained as a deacon either at this time or later. He began to compose hymns and write biblical commentaries as part of his educational office. In his hymns, he sometimes refers to himself as a "herdsman" (`allânâ), to his bishop as the "shepherd" (râ`yâ) and his community as a "fold" (dayrâ). Ephrem is popularly credited as the founder of the School of Nisibis, which in later centuries was the centre of learning of the Assyrian Church of the East (i.e., the Nestorians). In 337, emperor Constantine I, who had established Christianity as the state religion of the Roman Empire, died. Seizing on this opportunity, Shapur II of Persia began a series of attacks into Roman North Mesopotamia. Nisibis was besieged in 338, 346 and 350. During the first siege, Ephrem credits Bishop James as defending the city with his prayers. Ephrem's beloved bishop died soon after the event, and Babu led the church through the turbulent times of border skirmishes. In the third siege, of 350, Shapur rerouted the River Mygdonius to undermine the walls of Nisibis. The Nisibenes quickly repaired the walls while the Persian elephant cavalry became bogged down in the wet ground. Ephrem celebrated the miraculous salvation of the city in a hymn as being like Noah's Ark floating to safety on the flood. One important physical link to Ephrem's lifetime is the baptistry of Nisibis. The inscription tells that it was constructed under Bishop Vologeses in 359. That was the year that Shapur began to harry the region once again. The cities around Nisibis were destroyed one by one, and their citizens killed or deported. The Roman Empire was preoccupied in the west, and Constantius and Julian the Apostate struggled for overall control. Eventually, with Constantius dead, Julian began his march into Mesopotamia. He brought with him his increasingly stringent persecutions on Christians. Julian began a foolhardy march against the Persian capital Ctesiphon, where, overstretched and outnumbered, he began an immediate retreat back along the same road. Julian was killed defending his retreat, and the army elected Jovian as the new emperor. Unlike his predecessor, Jovian was a Nicene Christian. He was forced by circumstances to ask for terms from Shapur, and conceded Nisibis to Persia, with the rule that the city's Christian community would leave. Bishop Abraham, the successor to Vologeses, led his people into exile. Ephrem found himself among a large group of refugees that fled west, first to Amida (Diyarbakir), and eventually settling in Edessa (modern Sanli Urfa) in 363. Ephrem, in his late fifties, applied himself to ministry in his new church, and seems to have continued his work as a teacher (perhaps in the School of Edessa). Edessa had always been at the heart of the Syriac-speaking world, and the city was full of rival philosophies and religions. Ephrem comments that Orthodox Nicene Christians were simply called "Palutians" in Edessa, after a former bishop. Arians, Marcionites, Manichees, Bardaisanites and various Gnostic sects proclaimed themselves as the true Church. In this confusion, Ephrem wrote a great number of hymns defending Orthodoxy. A later Syriac writer, Jacob of Serugh, wrote that Ephrem rehearsed all female choirs to sing his hymns set to Syriac folk tunes in the forum of Edessa. After a ten-year residency in Edessa, in his sixties, Ephrem reposed in peace, according to some in the year 373, according to others, 379. Over four hundred hymns composed by Ephrem still exist. Granted that some have been lost to us, Ephrem's productivity is not in doubt. The church historian Sozomen credits Ephrem with having written over three million lines. Ephrem combines in his writing a threefold heritage: he draws on the models and methods of early Rabbinic Judaism, he engages wonderfully with Greek science and philosophy, and he delights in the Mesopotamian/Persian tradition of mystery symbolism. The most important of his works are his lyric hymns (madrâšê). These hymns are full of rich imagery drawn from biblical sources, folk tradition, and other religions and philosophies. The madrâšê are written in stanzas of syllabic verse, and employ over fifty different metrical schemes. Each madrâšê has its qâlâ, a traditional tune identified by its opening line. All of these qâlê are now lost. It seems that Bardaisan and Mani composed madrâšê, and Ephrem felt that the medium was a suitable tool to use against their claims. The madrâšê are gathered into various hymn cycles. Each group has a title — Carmina Nisibena, On Faith, On Paradise, On Virginity, Against Heresies—but some of these titles do not do justice to the entirety of the collection (for instance, only the first half of the Carmina Nisibena is about Nisibis). Each madrâšâ usually had a refrain (`unîtâ), which was repeated after each stanza. Later writers have suggested that the madrâšê were sung by all women choirs with an accompanying lyre. Ephrem also wrote verse homilies (mêmrê). These sermons in poetry are far fewer in number than the madrâšê. The mêmrê are written in a heptosyllabic couplets (pairs of lines of seven syllables each). The third category of Ephrem's writings is his prose work. He wrote biblical commentaries on Tatian's Diatessaron (the single gospel harmony of the early Syriac church), on Genesis and Exodus, and on the Acts of the Apostles and Pauline Epistles. He also wrote refutations against Bardaisan, Mani, Marcion and others. Ephrem wrote exclusively in the Syriac language, but translations of his writings exist in Armenian, Coptic, Greek and other languages. Some of his works are extant only in translation (particularly in Armenian). Syriac churches still use many of Ephrem's hymns as part of the annual cycle of worship. However, most of these liturgical hymns are edited and conflated versions of the originals. Ephrem's artful meditations on the symbols of Christian faith and his stand against heresy made him a popular source of inspiration throughout the church. This occurred to the extent that there is a huge corpus of Ephrem pseudepigraphy and legendary hagiography. Some of these compositions are in verse, often a version of Ephrem's heptosyllabic couplets. Most of these works are considerably later compositions in Greek. Students of Ephrem often refer to this corpus as having a single, imaginary author called Greek Ephrem or Ephraem Graecus (as opposed to the real Ephrem the Syrian). This is not to say that all texts ascribed to Ephrem in Greek are false, but many are. Although Greek compositions are the main source of pseudepigraphal material, there are also works in Latin, Slavonic and Arabic. There has been very little critical examination of these works, and many are still treasured by churches as authentic. O Lord and Master of my life, take from me the spirit of sloth, meddling, lust of power, and idle talk. O God, be gracious to me, a sinner. 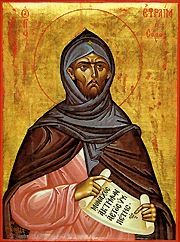 Though St. Ephrem was probably not formally a monk, he was known to have practiced a severe ascetical life, ever increasing in holiness. In Ephrem's day, monasticism was in its infancy in the Egypt. He seems to have been a part of a close-knit, urban community of Christians that had "covenanted" themselves to service and refrained from sexual activity. Some of the Syriac terms that Ephrem used to describe his community were later used to describe monastic communities, but the assertion that he was monk is probably anachronistic. Ephrem is popularly believed to have taken certain legendary journeys. In one of these he visits St. Basil the Great. This links the Syrian Ephrem with the Cappadocian Fathers, and is an important theological bridge between the spiritual view of the two, who held much in common. Ephrem is also supposed to have visited Abba Bishoi (Pisoes) in the monasteries of the Wadi Natrun, Egypt. As with the legendary visit with Basil, this visit is a theological bridge between the origins of monasticism and its spread throughout the church. The most popular title for Ephrem is Harp of the Spirit (Syriac Kenârâ d-Rûhâ). He is also referred to as the Deacon of Edessa, the Sun of the Syrians and a Pillar of the Church. With the Tradition of the Church, Ephrem also shows that poetry is not only a valid vehicle for theology, but in many ways superior to philosophical discourse. He also encourages a way of reading the Holy Scripture that is rooted in faith more than critical analysis. Ephrem displays a deep sense of the interconnectedness of all created things, which leads some to see him as a "saint of ecology." "Whenever I have meditated upon You I have acquired a veritable treasure from You; whatever aspect of You I have contemplated, a stream has flowed from You; there is no way I can contain it. Your fountain, Lord, is hidden from the person who does not thirst for You" (Faith 32:2-3). "The hutzpah of our love is pleasing to you, O Lord, just as it pleased you that we should steal from your bounty." "The hater of mankind, in his shameless impudence, attacks the Holy Church in the person of her servers. O Lord, do not leave Thy holy Church without Thy care, that the promise that Thou didst utter concerning her invincibility may not be shown false." "Blessed is the person who has consented to become the close friend of faith and of prayer: he lives in single-mindedness and makes prayer and faith stop by with him. Prayer that rises up in someone's heart serves to open up for us the door of heaven: that person stands in converse with the Divinity and gives pleasure to the Son of God. Prayer makes peace with the Lord's anger and with the vehemence of His wrath. In this way too, tears that well up in the eyes can open the door of compassion." "The Seraph could not touch the fire's coal with his fingers, but just brought it close to Isaiah's mouth: the Seraph did not hold it, Isaiah did not consume it, but us our Lord has allowed to do both." (Ephrem is) "The greatest poet of the patristic age and, perhaps, the only theologian-poet to rank beside Dante." — Robert Murray. By the radiance of miracles you illumined the whole universe. O our holy father Ephraim, pray to Christ our God to save our souls! You are indeed a father of high renown. This page was last edited on February 5, 2019, at 05:13.